This recycled plastic egg whale craft is the perfect example of turning trash into treasure! 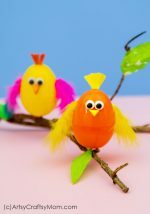 Reuse empty plastic eggs and paper scraps to make this craft. If you’ve been making our projects these past few weeks, congratulations – you’re quite the crafter! But this can also mean that you’re reaching the end of your craft supplies. Well in that case, don’t just go out and buy new materials yet – let’s finish up whatever’s left. 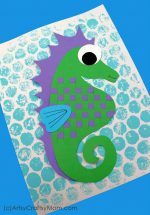 And if you’re wondering what we can make with an empty plastic egg, a single googly eye and bits and pieces of paper, we’ve got just the thing for you – a recycled plastic egg whale craft! Let’s show our kids that even a little can go a long way when you have enough imagination and the will to make it work. 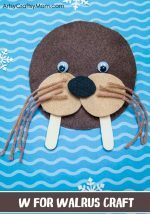 Ask them if they can think of any other ways to use up the remaining supplies with this craft! 1. With pencil, draw an outline of the whale’s tail on the blue paper and the water spray on the white paper. 2. Cut out the shapes neatly. 3. Stick on the googly eye on the wider end of the plastic egg. Draw on the whale’s features with markers. 4. 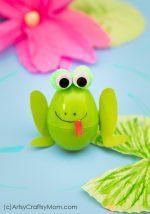 Use glue to stick on the tail at the narrow end of the plastic egg. Glue the water spray to the top of the whale. 5. Your whale is ready! Now place him in an ocean of blue chart paper by sticking some tack it at the bottom of the plastic egg. 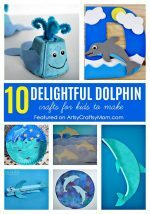 If you enjoyed making this cute little whale, check out our Origami whale craft too. 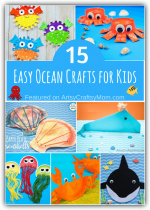 And if you want more, we’ve got some ocean themed pom pom mats and a whole collection of ocean themed crafts so you can have an entire assortment of ocean creatures sitting on your table!